Biblical fiction with a kingdom message! When an unexpected assault occurs on a summer night, Miriam is thrown into a world of unfamiliar voices and feelings. She moves through life bound by dozens of lies, suffering from 7 spirits set out to destroy her. But what seems impossible to escape is merely a deception. A second unexpected encounter turns the tables, offering a voice of truth. Starting over, Miriam joins a rogue group and crosses paths with 7 others harboring her old spirits. She has the opportunity to fall prey once again or to rise above and conquer her past. 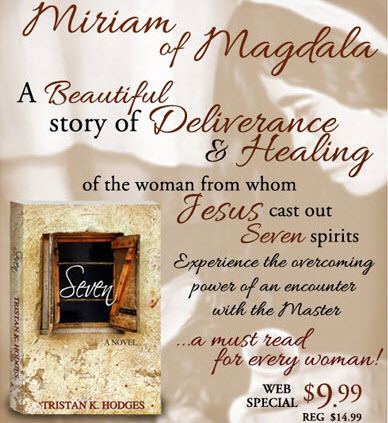 Told through the eyes of Miriam of Magdala, "Seven" links the first and twenty-first centuries, the natural and supernatural. It reveals how lies can derail your destiny and how truth can take you places unimaginable. Above all, it offers a message of hope, healing, and redemption. FROM A RECENT BLOG POSTING BY THE AUTHOR: Biblical fiction, in its own right, captures my attention like no other genre. I love a good story and I equally love God’s word, so the combination of the two generally sends me over the moon. If you have similar affectations, my novel Seven awaits you! Based on historical people and events, Seven takes information from the Bible and fills in the missing blanks. In Jewish culture this is called midrash. Other authors, of course, have traveled this literary road. Yet while some novels based on Scripture offer messages of hope and love and grace—all wonderful, mind you—mine goes a step further, adding elements of spiritual insight and offering an encounter with God. Charged with spiritual realities that face each of us in this life journey, my book offers an opportunity to see behind the scenes in the spirit world, catching a glimpse from God’s perspective. And how to live once the proverbial veil has been removed. What this book is not: it is not about the seven deadly sins; it is not about a love affair between Mary Magdalene and Jesus; it is not mindless beach book (we all know the ones! )… What this book is: it’s about life’s circumstances that can keep us bound up; it’s about fear and lust and rejection and pride; it’s about redemption, freedom, persistence, and faith; it’s about the forces of darkness and the kingdom of light; it’s about making choices that impact your life as well as those around you; and it’s about God’s heart toward you! Go ahead! Get a copy and see for yourself. CLICK HERE to listen to an inspiring message from the author, TRISTAN HODGES!